A global war with staggering loss of life. The very air became a battlefield, with airplanes, invented not long before, turned into death machines. An influenza epidemic killed 50 million worldwide. Young American men returned from war, and women from military offices and civilian wartime industries. They worried that another war or epidemic could end their lives, so many of them did not want to live the quiet, seemingly dull, lives of their Edwardian parents. The young were hyped up from the war, accustomed to the anxiety of wartime. Popular music and dances became more energetic. Clothing became relaxed. To add to the woes, Prohibition spread nationwide in 1920. In the 1920s, the Jazz Age, women changed. – Wore short skirts to reveal their legs, which had not been done for thousands of years. Imagine how the older generation felt about women’s behavior and appearance. 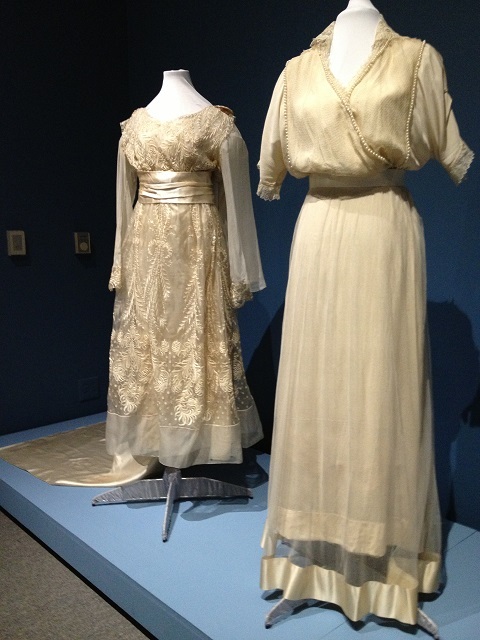 These two bridal gowns, worn before the 1920s, show rising hemlines. 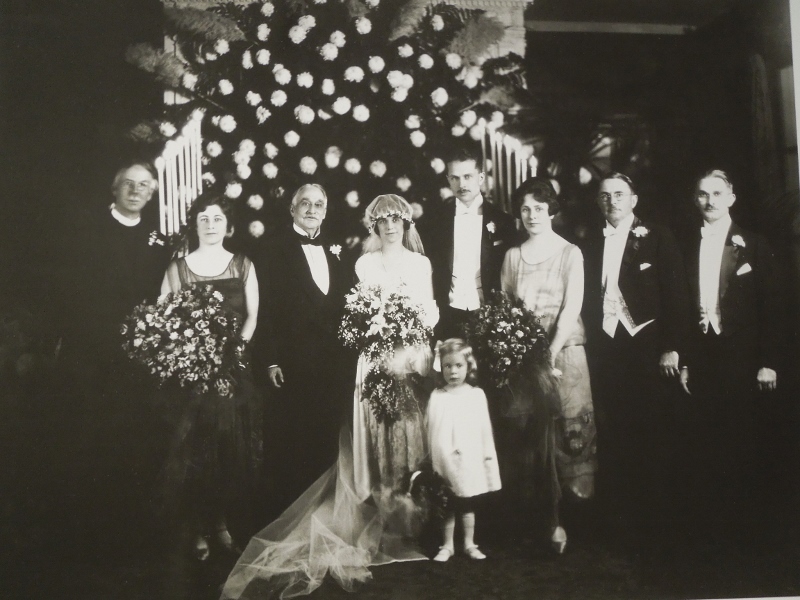 The 1913 wedding dress on the right has a peekaboo effect. The underskirt stops above the ankles. The bridal gown on the left is later, during the war. The skirt is short and a detachable train fastens at the shoulders. 1920s wedding gown. Asymmetrical hem. In the 1920s, women used undergarments to deemphasize their bust and hips, just the opposite effect of the old-fashioned corsets. The goal was an androgynous figure, so dresses no longer nipped in at the waist, as shown in the gown at the right. This gown has embroidered lace. 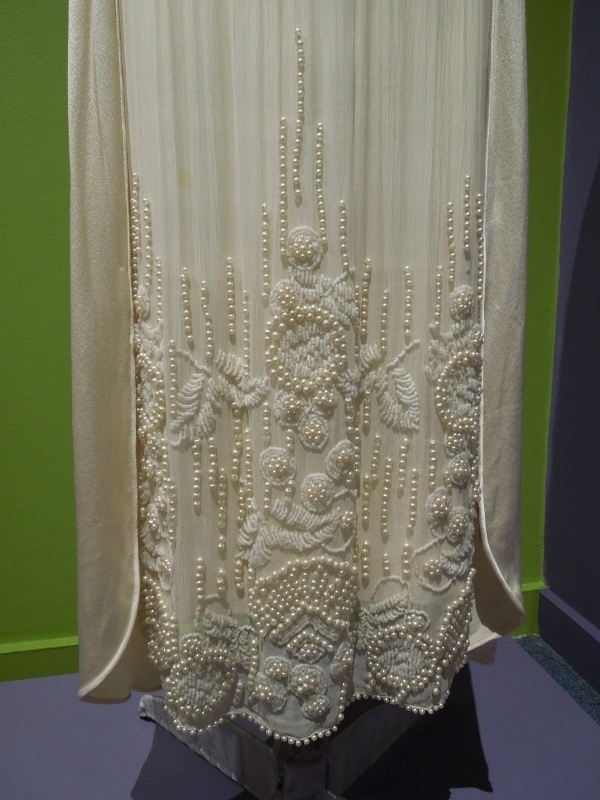 We think of the 1920s as the era of beaded dresses. 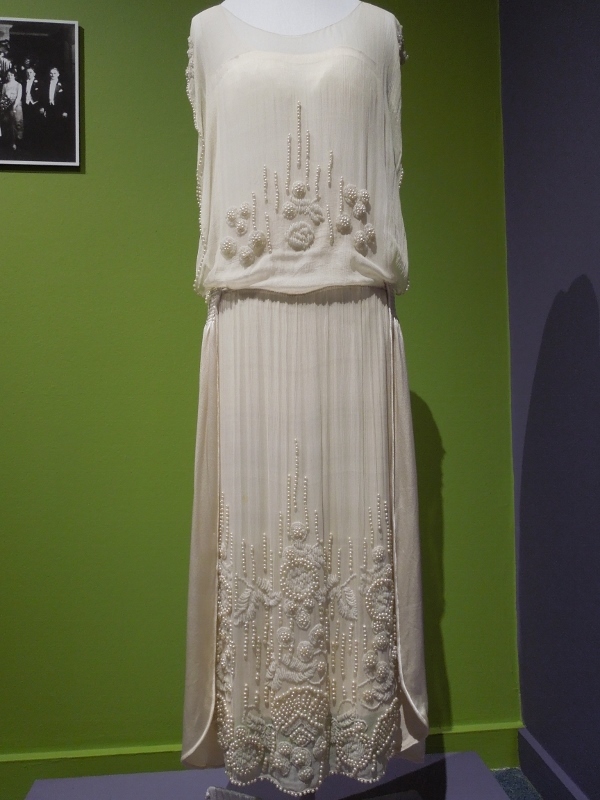 The Pasadena Museum of History, where over 40 antique and vintage bridal gowns are on display until July 14, has three gorgeous 1920s beaded bridal gowns. One is a pastel color. Jazz-Age brides often wore elaborate headdresses or caps. Here is a photo of Dorothea Underwood. There are closeups of her dress at the end of this post. Dorothea’s dress is sleeveless, but she wore gloves past the elbow, revealing her upper arms. Although the dress is short, she wore a long train, which you can see near the toes of the little girl in the wedding party. Dorothea’s bridal cap is attached to, or part of, a long, filmy veil. Her silk gown has faux pearls, some of them clustered and surrounded by beads. 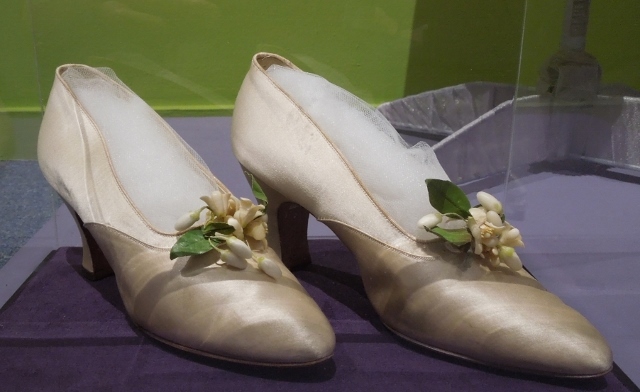 Her shoes are silk satin with faux orange blossoms. Come back on Friday for wedding dresses of the 1930s. Great post, Pam. Seeing Dorothea’s wedding dress on the same screen with her wedding photo puts it all into perspective. The curators spent two years putting this exhibit together.